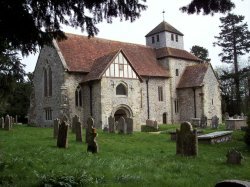 St Mary's Church Breamore is near Fordingbridge in the New Forest, Hampshire. It is a beautiful Anglo-saxon church built around 980 AD. Built of flint and stone the grade 1 listed church is exceptionally long at 96 feet. The first time I heard of this church was from a friend that had been there. He told me that he had seen a figure of a man walking from the side of the church over to the crypt which is across the graveyard. He told me that the figure had disappeared into the crypt and when he had gone over to it there was no one to be seen. I decided then that it was worth a visit. The night that we went to Breamore was a fairly light night. The moon was bright and there were no clouds. We arrived at the church passed midnight. When we arrived we parked right outside the gate and went to explore the church and graveyard. We walked up the path towards the church doors. It didn’t feel scary because it was so light that night. We decided to walk around the church and headed for the back of the church. As we walked round to the back it started to get darker as the church was blocking out some of the moon light. It was here that one of us thought we saw a grey shadow move along the side of the church round to the front. We decided to go and investigate what it might have been. But there was nothing to see as we approached the spot where we thought the shadow had been seen. We continued back round to the front of the church. And we decided to look for the crypt I had been told about. The crypt is across from the church amongst the other graves. It is below ground and has a few steps leading down towards an old wooden door. But as you can image the door to the crypt was locked. We had a look around and sat for a while by the crypt to see if we could see or hear anything. But after about 20 minutes we decided to walk back over to the church. We then sat in the church doorway for sometime but nothing seemed to be happening so we decided to go back to the car. The two boys decided that they wanted one last look around the back of the church. So off they went. Us two girls that were left went back to the car. We got back to the car and sat and waited for the others to come back. As we were sat waiting we had noticed that the moonlight had gone in behind some clouds which had made it considerably darker. We could only see a little way in front of the car now. As we waited we sat talking in the car and we had the interior light on, so that made it even harder to see out. But we heard the gate from the church open and close. We assumed that it was the others coming back to the car. After about 20 seconds we started to wonder why they hadn’t got back into the car and why they were so quiet. Then we heard footsteps in the gravel next to us and then a very faint tap on the side of the car. As we could not see out we turned off the interior light. It was pitch black now outside and we couldn’t really see a lot. As we sat quietly we heard another tap on the side of the car. We turned on the headlights to see if we could see the others and to see if they were messing around. But we couldn’t see anyone near the car. But what we could see was the others walking down the path from the church. So we realised it couldn’t have been them. We did check to make sure it wasn't them and they assured us it wasn’t. Although we could not be totally sure that this had been paranormal activity, we were quite sure that there was no logical explanation. The gate is a solid wooden gate with a latch which we had closed behind us on the way back to the car. No animal could have opened this gate. And the sounds we had heard in the gravel beside that car were definitely footsteps. Without a doubt. But we all agreed that the tapping on the side of the car could have been from an animal. We have only been back a few times since but have never experienced any paranormal activity, but we will keep trying.